Îles flottantes or Floating Islands is the intriguing name of this traditional French dessert. 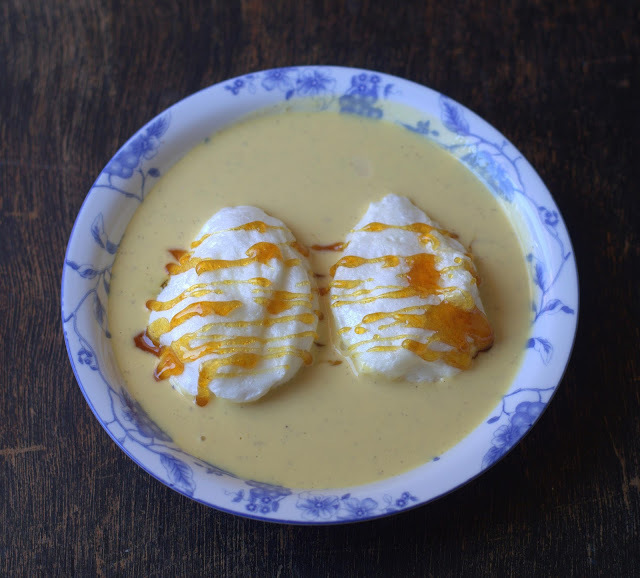 Fluffy poached meringue floating in chilled crème anglaise, garnished with shards of caramel. A summer dessert was my thought when I drooled over it first! Not that you need to wait for a particular season or reason to relish anything good! The soaring mercury levels just make ‘cool and sweet’ a much more welcoming thought. Whether or not a particular recipe makes to my list of favorites is immaterial, a new technique is compelling enough to give it a try. Meringue is magical of course and I had never poached whipped egg whites. So I did not waste any time making some orange crème anglaise, left in the fridge to thicken and chill really well . Washed and dried the bowl and beaters to whip the whites the next day. I can be quite annoyingly obsessive here! Whenever I leave homemade custard to chill, I just can’t resist eating it by the spoonful. But I do keep reminding myself that it is a component of the dessert and I must stay away from it. Just as well, this orange scented custard stayed in the fridge in my baking kitchen or it would not have made it! It was amazing to see spoonfuls of whipped meringue puffing up like crazy within seconds when poached! You must watch this if you haven’ t yet. They tuned out spooky light and soft. The caramel is optional but added a very nice textural contrast, so do not skip it. It felt a bit weird to eat the poached meringue, but I might develop a taste for it! So this is how we go about it. 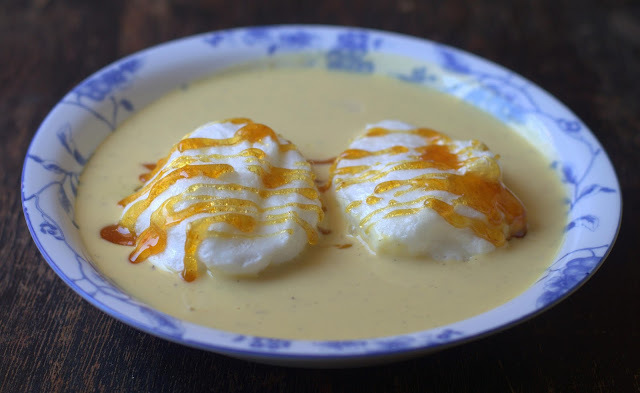 To make the crème anglaise: Traditionally the milk used to poach the whites is used for making the custard, but if you love your custard chilled, make it at least 8 hours ahead. 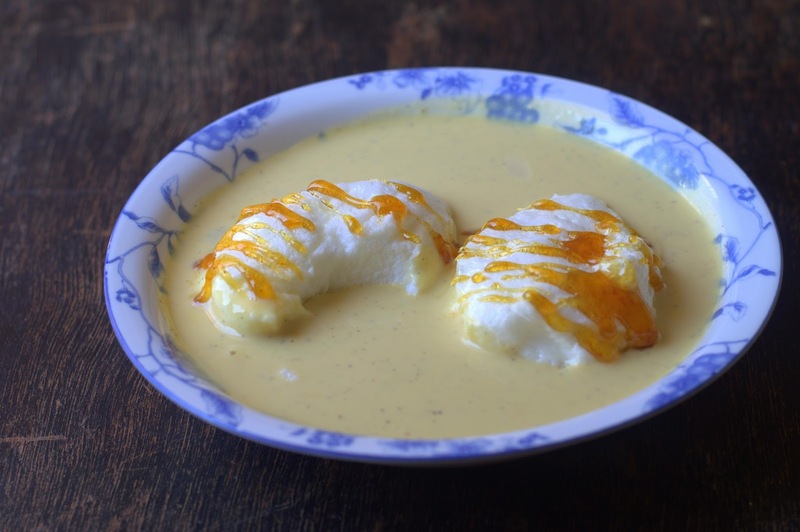 For a detailed recipe with tips, please refer this post if making homemade custard for the first time. To make the islands: Please read this post on separating and whipping whites if you have never whipped whites before. Watch the above video about separating eggs. Spread a clean kitchen towel on the counter near the stove and have a large slotted spoon at hand. [The towel will help the floating islands drain after poaching.] Put the milk in a wide saucepan and bring it to a simmer over low heat. Meanwhile, put the egg whites in the clean bowl of a stand mixer fitted with the whisk attachment, or use a large bowl and a hand mixer. Beat the whites on medium speed just until foamy. Add the cream of tartar. When the eggs turn opaque, increase the mixer speed to medium-high and add the sugar about 1 tablespoon at a time. Whip until the meringue is firm but satiny and still glossy. Do not worry about the shape of the ‘islands’ they are meant to look homey. So you have every excuse to forget that ‘neat’ bit! This needs to be made at the last minute literally before you pass on the bowl. Please do read this post if making caramel for the first time. I also read about baking the meringue for this desert and I am certainly going to be trying that as well! (I can see the French purists glare at me) Expect an update here on what I liked better – the baked meringue or the poached one! Should you try this? 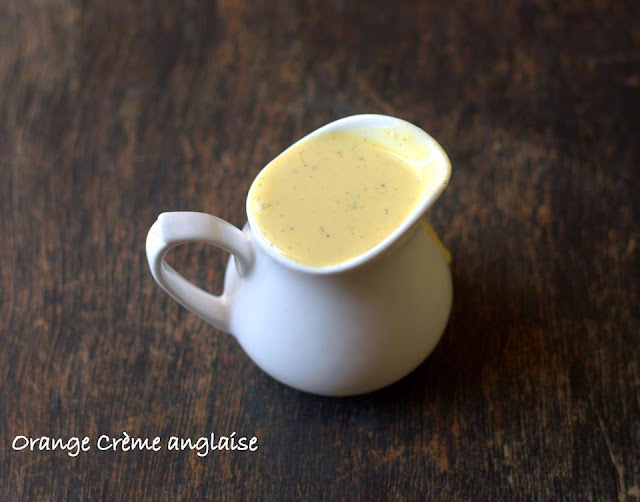 If you love crème anglaise and everything eggy, absolutely!